Central Naval Instrument Flying Training School, with accessory training. 1. Weston Park (by arrangement with M.A.P. ) situated 12 miles S.E. Of Hinstock and 8 miles N.W. of Wolverhampton. 2. Bratton (by arrangement with Air Ministry) situated 6½ miles S.S.W. of Hinstock and 8 miles E. of Shrewsbury. 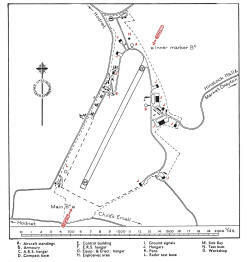 The airfield lies 4 miles S. by W. of Market Drayton and 1¾ miles W. of the village of Hinstock. Stoke on Trent lies 13 miles N.E. and Shrewsbury 11½ miles S.W. Birmingham lies 30 miles S.E. The Shropshire Union canal, running from Birmingham, through Market Drayton to Chester, passes 2½ miles N.E. 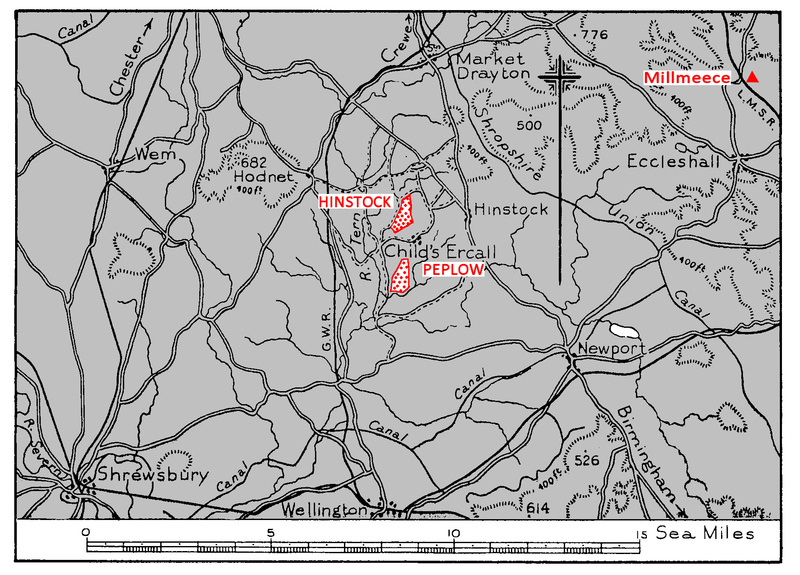 ; the river Tern, flowing S. towards its junction, 10½ miles S.W., with the Severn, passes ¾ mile W.
The G.W.R. line to Market Drayton runs 2 miles W. of the airfield. Secondary road to Hodnet, and to Hinstock amend the main Market Drayton road. Hodnet railway station, 2¼ miles W.N.W., on the G.W.R. line to Market Drayton, where there is a junction with the L.M.S. Control building on NW, side of landing area. Keeps watch on Naval Safety wavelength. Combined Control with adjacent R.A.F. Stations by tie-line and combined left-hand circuits with R.A.F. Peplow. Ground signals area close S. of Control building. Sodium lighting for fog conditions. 04/22 QDM. 037°/217° .... 1,400 X 50 yds. A 25 ft. perimeter track (to be widened to 40 ft.) bounds the landing area from the centre of its W. side, round the N. end and down the E. side. It gives access to all station buildings and hangars. Extension of perimeter track in progress. Avoid crossing R.A.F. Peplow, lying I mile S.S.E. 90 ft.
W/T. masts at S.E. extremity of the airfield. Windsock on the E. side of the landing area, near the compass base. One H/F (second H/F, also VHF to be installed). Portable equipment (2 floodlights) on demand. I line M/F. (not yet available). 2 H/F Control channels (" A " and " B "). VHF (to be installed). 2 lines H/F. Officers quarters at Hinstock Hall, 1¾ miles E.
Ratings quarters at Childs Ercall,½ mile S.
W.R.N.S. quarters at Steppes farm, Childs Ercall. One, tarmac. Diameter 70 ft.
5 bomber type A/C standings. On E., S.E. and N.W. sides of the landing area. Sick Bay at The Hall, Childs Ercall, ½ mile S. of the airfield. First Aid facilities at the airfield. Office in Control building. 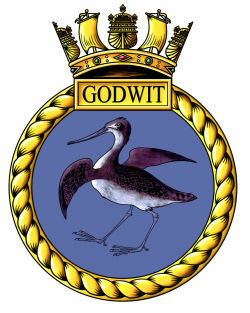 Full meteorological service by Naval personnel available . 24,000 gallons. Two further installations of 8,000 gallons each to be provided. A/c. Radar test base to be provided. One large Reserve Servicing and one large A.R.S. hangar to be provided. Workshops to 2 3 squadron scale. Explosives area at N. end of airfield. 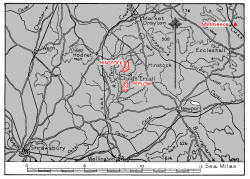 Squadron reformed as an offshoot of No.758 Squadron at Hinstock on o1.06.11945. Squadron personnel took passage to NAS Schofields, Australia seven weeks later. Equipped with. Oxfords and Harvards. Squadron formed as an offshoot of No.758 Squadron 0.011945. Squadron personnel took passage to RNAMY Coimbatore, India on 16.p4.1945, without aircraft. Moved here from RNAS Worthy Down August 1945 Operated out of Hinstock's satellite at Peplow. disbanded on 21.02.1946. Moved here from RNAS Donibristle on 15.08.1942. Disbanded at RNAS Peplow 14.05.1946, to become 'B' Flight of 780 Squadron. Mainly equipped with Oxfords; also received Anson, Harvard IIb, Reliant, Tiger Moth, and Wellington XIs. Reformed at Hinstock on 28.03.1946. Based at the Peplow satellite. On 14 May 1946 the remnants of No.758 Squadron were absorbed to form 'B' Flight; this moved to RNAS Crail on 17.121946. Equipped with Oxfords, Harvards, Fireflies, Tiger Moths, and Lancasters. Advanced Single .Engine Conversion & Refresher Flying Training Unit. Moved here from RNAS Halesworth 28.11.1945. Disbanded on 18.03.1946. Equipped with an assortment of Barracudas, Fireflies, Harvards, Seafires, and Tiger Moths. 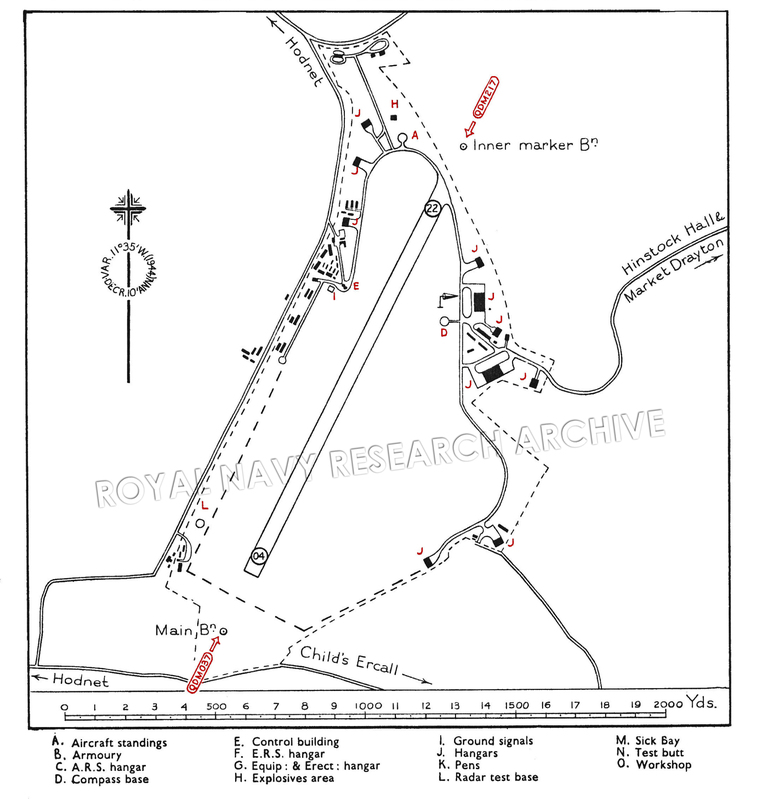 By the end of 1942 it was clear that the RAF had no use for the Charlton Horethorne RLG and the airfield was transferred to the Admiralty; the station commissioned as H.M.S. HERON II on New Year’s Day 1943.